The base of an island fans out beneath the surface of Lake Superior in Ontario and disappears to the dark depths of this great lake. The hard rocky base of the island seen in this aerial picture of Lake Superior has tinges of red rock with streaks of white giving the whole scene an abstract art look. The red is a result of ferric iron reacting to oxygen in the rock sediment. A flight-seeing tour of Lake Superior from Thunder Bay, is one of the best ways to see Lake Superior from an aerial perspective with it's many beautiful islands. Lake Superior is the largest of the Great Lakes and it is also considered the cleanest. From the air one can see that the island supports a small stand of trees which are huddled together on a gravelly area of the island very close to the water's edge. 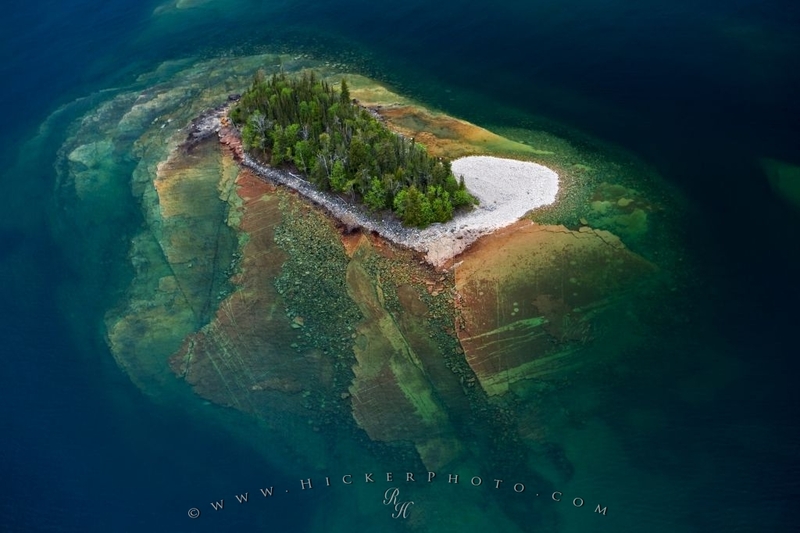 Aerial photo of an island with an abstract art appearance, Lake Superior, Ontario, Canada.